A local health official checks the temperature of a newly arrived U.S. soldier at the airport in Robertsfield, Liberia, as other troops disembark. 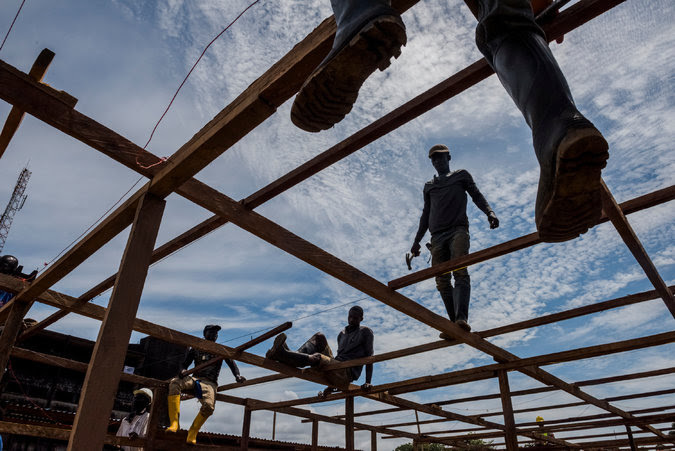 MONROVIA, Liberia — In the furious battle against time and a rampaging Ebola epidemic, the gravel crusher joined a long list of enemies. Petty Officer 2nd Class Justin A. Holsinger was standing on an acre of neatly cleared dirt, surrounded by coconut trees, bush and bright yellow earth-moving equipment — the construction site for the first of 18 Ebola treatment centers the American military plans to build in Liberia. Suddenly, around noon on Tuesday, the local contractor announced that the crusher’s engine, needed to smash rocks, had broken. Ergo, no gravel to lay down. Two weeks after President Obama announced that time was running out in the fight to stem the epidemic, the American treatment centers planned here in the center of West Africa’s Ebola crisis are still a long way off. The beds for the first field hospital, flown in by the military from Kelly Air Force Base near San Antonio, remained in a hangar at Liberia’s main international airport, wrapped in plastic alongside the tents, generators and the medical equipment needed to set up the facility. Military planners say it will probably be another 10 days before even this first 25-bed treatment center is up and running. And that unit is meant to be used solely by health care workers who become infected — not for the hundreds of new Ebola cases that have sprung up in this country in recent weeks. They will have to be served by the other 17 centers further back in the pipeline. “The response here is a race against time,” said Nancy Lindborg, assistant administrator with the United States Agency for International Development, which is helping the effort. The need could not be more clear. For every Ebola patient being treated in a hospital or other setting where infected people can be isolated, there are about four more battling the disease at home, according to the Centers for Disease Control and Prevention, virtually guaranteeing that Ebola victims will pass the virus on. Every 30-day delay it takes to vastly increase the number of people in treatment beds could triple the number of cases occurring each day at the epidemic’s peak, the C.D.C. warned. 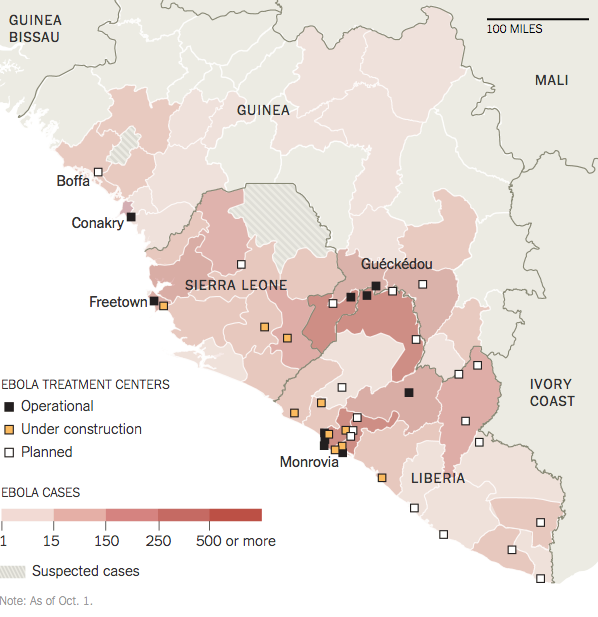 Even the Ebola case that surfaced in Dallas this week appears to stem from the lack of treatment beds here in Liberia’s capital about 5,700 miles away. Thomas E. Duncan, the Liberian who took the virus with him to Dallas, helped carry home a neighbor who was gravely ill with the symptoms of Ebola on Sept. 15, holding her by the legs after a hospital turned her away because there were no beds, her family and neighbors said. She died the next day. A few days later, Mr. Duncan flew to the United States, Liberian officials say, his own symptoms not yet evident. The urgency here in Liberia is so great that Capt. Andrew Hill, an American Army engineer, was recently sketching drawings for a new treatment unit in the car on the way to view the site. He then photographed it with his telephone camera and emailed the image to Vicenza, Italy, where American officers could turn it into an architectural drawing. But in the end, the biggest obstacle may come after the centers are built. The military is not filling the treatment centers with doctors and nurses, so the U.S.A.I.D. and the Liberian government are trying to figure out how to run them once they are completed. The African Union, nongovernmental organizations and other nations — including Cuba — have promised to send health care workers to the region, and American officials are hoping to patch together enough personnel to operate the centers effectively. That includes training as many as 500 volunteers a week, a goal that many find overly optimistic. “It will be a huge challenge,” said Dr. Timothy P. Flanigan, a Brown University infectious disease specialist who has been in Liberia for the past month. 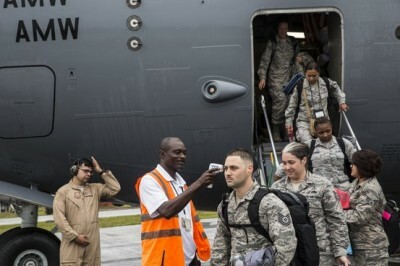 For the Pentagon, which expects to deploy more than 3,000 troops in the effort, mostly from the 101st Airborne Division, the sprint to catch up with the virus began two weeks ago at Roberts International Airport, known colloquially here as Robertsfield, the aged and decrepit structure that is Liberia’s main international airport. Planes land in viewing distance of the ruins of the passenger terminal destroyed by rockets during Liberia’s civil war. Now, Robertsfield is the receiving port of C-17 military cargo flights bringing hundreds of thousands of tons of equipment to set up the Ebola treatment units, as promised by Mr. Obama. But when Col. Brad Johnson of the Air Force, the commander of the Joint Task Force-Port Opening, arrived at Robertsfield last month, he found a runway too degraded to withstand an avalanche of relief cargo. He had hustled to San Francisco International Airport within 10 hours of receiving his orders to deploy to Liberia, but upon arriving here found that the six-month rainy season had left holes the size of craters in the airport’s World War II-era runway. So Colonel Johnson and a crew of engineers and construction workers have been filling in cavities, hauling rocks, sweeping up pebbles and building tented residences for the coming American troops in a round-the-clock operation. Construction delays caused by things like a temperamental backhoe loader and a road grader with a busted steering hose have also bottlenecked the campaign. Hauling parts and equipment from the United States and Europe takes time, and then there are negotiations with local contractors for heavy equipment. The process is also long because setting up an Ebola treatment unit is nothing like setting up a regular Army field hospital. Military field hospitals usually treat trauma patients. An Ebola treatment unit requires quarantine rooms, chlorine shower stalls and larger-than-average bathrooms — because many Ebola patients die in the bathroom, where they collapse after violent bouts of vomiting and diarrhea, and need to be removed. On Wednesday, Michael Lumpkin, an assistant secretary of defense, was at a 300-bed Ebola treatment center under construction on the site of Liberia’s wrecked and never-occupied Ministry of Defense, built by the dictator Samuel Doe before he was killed in 1990 by a warlord, Prince Johnson. Then Mr. Lumpkin arrived at the ELWA — Eternal Love Winning Africa — treatment center managed by Doctors Without Borders that is widely viewed as the model for the American units the military is building. In the triage area, health workers behind plastic orange fencing greeted an ambulance with two new suspected cases, barking instructions at the driver. The driver scrubbed his gloved hands, took off his gloves, and then washed his hands again in the chlorine water streaming from a cooler — such chlorinated faucets are at the entrance to public buildings, hotels, supermarkets and a slew of other places. Finally done, he moved away from the open ambulance. A minute passed, and two skinny legs appeared, attached to a 9-year-old boy. Slowly, he made his way to a plastic chair in the triage area, still separated from the workers by 10 feet and the plastic barrier. He collapsed into the chair and stared at the workers, who were wearing plastic shower caps and gloves. He looked small and frightened. “Small boy, wha’ your name?” the triage worker shouted. Two feet away, Mr. Lumpkin surveyed the scene. Hours later, he was still grappling with it.